Ruder 7 (means The 7 of diamonds) is a Danish agency that delivers news, articles, lectures, consultancy, quizzes, puzzles etc. Subjects that the agency is specialized in, are litterature, opera, history, traveling, bridge, chess, quizzes, sports (in particular golf, cycling, soccer, cricket, snooker, billards, tennis …), and humour. Ruder 7 is managed by Svend Novrup who has a degree in Nordic philology and has worked as journalist and author (124 books, 20 translations) since 1969. His biography follows below. Svend Novrup, born November 9 1945, degree in Nordic Philology from the University of Copenhagen. Has worked as a commentator at radio and television. Author of 125 books. Several from them translated into up to six different languages. Has translated 20 books and contributed to or edited some dozens others. He has produced manuscripts for all major quiz programs in Danish radio and television. He is a specialist in subjects like Harry Potter, Dan Brown and ‘the da Vinci Code’. In 2019 he is mainly occupied with articles about bridge, traveling and golf. He is contributing to several newspapers and magazines, among them Skakbladet, Dansk Bridge, Golfbladet and golfbladet.com. 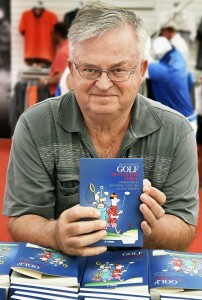 For 10 years he wrote daily stories for the website golfonline.dk. His wife Mette works as photographer on the bridge, golf, and traveling jobs. Together Mette and Svend Novrup have pictured and reviewed golf courses and resorts all over the world. From Mauretius, South Africa, Morocco, and The Canary Islands to Thailand, Iceland, United States and The Dominican Republic. For a travel fair in Copenhagen 2010 Novrup produced a travel brochure for The Tourist Office of The Dominican Republic. In 2015 the schedule included South Africa, Spain, Portugal, Germany, Poland, Norway, Sweden. In 2016 it includes Spain, Portugal (Porto Santo), Morocco, Germany, Poland, Sweden, and Iceland. Mette Novrup enjoying the sun at Kongsberg GK in Norway. He edited the bridge and chess columns in the major Danish newspaper Politiken 1970-2000 and wrote in the same newspaper about literature, language, traveling, theatre, music (in particular opera), film and sports (in particular cycling, golf, soccer, cricket, curling, tennis etc). Today he reviews theatre, opera, and books free lance for several newspapers. Has written for the local newspaper Kjerteminde Avis and its later website since 1959. Together with the Danish violinist Kim Sjøgren he has produced a CD with Hans Christian Andersen quotations from the travels of the author, read out by Novrup with background music by Sjøgrens Mermaid String Quartet. He is a popular lecturer of subjects like ‘nicknames’, ‘the Danish medias’, ‘local history’, ‘Tour de France’, ‘World Championships of soccer’, ‘Ryder Cup’, ‘History’s greatest chess masters’, the international bridge world, etc. He has organised grandmaster tournaments of chess featuring among others Gary Kasparov (playing GM Curt Hansen in the knightshall of Valdemarslot (the castle of Valdemar)), the Polgar sisters, the Indian world champion Viswanathan Anand and the current world champion, Norwegian Magnus Carlsen. He organised the first Danish European Cup of pairs in 1977 with 280 pairs from all Europa participating in celebration of the 50th anniversary of the world’s oldest bridge tournament, the tournament of Copenhagen Clubs, played annually since 1927. In 2000 he organised a celebration the the 75th anniversary of contract bridge with Zia, Helgemo and other bridge starts in combination with politicians (among them former prime minister Paul Schlüter) and stars from several sports. About 10.000 euros was collected for the Danish Red Cross on that occasion. He has organised about a dozen tournaments of bridge and golf combined, among them Danish championships. He was president of a worldwide organisation of chess journalists, AIPE, from 1974-77, has been a board member of the IBPA, and on the boards of the Danish Chess Union as well as the Danish Bridge Federation. In 1993 he won the European Philip Morris Simultaneous Pairs ahead of 20.000 pairs together with Jesper Thomsen, scoring 77,44%. Placed 5th in the World Pairs consolation in 1974 in Las Palmas with 19 year old Trine Dahl. Played in the Danish Junior National team in 1969 and later in a Danish mixed national team in an EU Championship. Played in Menton 2004 in a Faroe Island team after coaching the the Faroe Island national team 2001-2004 and taking them to their first European Teams Championship with great success. It was a big media event in the Faroes when the open team defeated Russia, and the ladies France, at the same time! The 125 books of Svend Novrup includes 39 on bridge reaching from an encyclopedia of bridge to booklets on Roman Key Card Blackwood and three books with bridge humour. The other 86 books include a five volume chess encyplopedia, three books on Tour de France, the history of the world championship of soccer, the history of the Ryder Cup, a book on womens’ lib, a book with the history of Denmark’s smallest newspaper at its 125th anniversary, and diverse books on games or with quizzes, including one about the Harry Potter books. The books have been published in a total number of more than half a million. One of the latest publications is a book, ‘Golf med glimt i øjet’, with golf history, anecdotes, and everything with golf humour. Another one tells the history of the Ryder Cup.